Courting bloggers – grass roots promotion that works. March 3rd, 2009 · Comments Off on Courting bloggers – grass roots promotion that works. 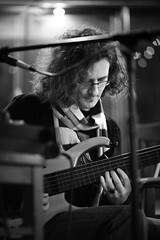 Here’s are some fantastic photos taken at the Solo Bass Night in Milton Keynes last Sunday by Christian Payne. Christian is a really great photographer, photo journalist, documentary maker and new media junkie. His latest film about displaced Iraqis living in Jordan is vital viewing. A couple of months back, Sarda came up with the idea of an aggregated blog bringing together lots of the different thinkers writing about the future of the music industry. My ‘future of music’ posts are up there alongside fab thinkers and writers like Gerd Leonhard and Andrew Dubber. …which I guess means I ought to get back to writing about the future of music! Despite not blogging about it as much of late, I’ve been doing lots of thinking about it, from a lot of different angles. Today’s fairly throw-away thought was just that ‘experience is not downloadable’ – I was walking through Time’s Square in NYC, and wondering how the big theatrical shows can afford to keep running at the level they do, here and in London. And part of it is that they offer an experience that can’t be downloaded – ACTUALLY going to the show is central to any kind of engagement with it. You could download the soundtrack, even a live video of the show, look at pics online, download and print out the sheet music, but none of that is going to mean much if you haven’t experienced it. One of the big questions, and the hardest part of this whole thing is still – what do you do as a musician if you don’t want to make the majority of your money in advertising or running a snack bar at your gigs? One last thing for now – for us indies, Cds aren’t going anywhere while we’re still playin live shows. People want to buy music, take a piece of it home – like the fluffy indonesian Simba that the peeps here in NYC pick up for $15 after seeing the Lion King, folks want to get some discs to listen to in the car on the way home. I wonder what the first technology that allows for the easy buying of downloads at gigs will be? a USB still is just a posh CD – what about actual transfer to iPod/phone/whatever? We can talk about fair trade presents (and beautiful solo bass cds) later but for now, we’re looking for free online pressies. They can be as simple as recommendations for cool websites, or links to sites with free (legal) MP3s, or cartoons, films. Please don’t post links to anything where the legality or morality of the derivation is questionable, like MP3 blogs not sanctioned by the artists etc. but links to last.fm pages with free mp3s are good, or even last.fm pages where albums are streamable if not downloadable. The End of Control – on ongoing ebook, readable as a blog or downloadable as PDF chapters, on the changes in the music industry. Free Culture – another e-book about the nature of copyright, ownership and the proliferation of ideas and content in a digital age. New Music Strategies – a third e-book about the changes in the music industry. More deeply thought out stuff on where it’s all going. So there you go, three books for Christmas (or for you Americans, you can see them as a Thanksgiving present too, should you wish to, along with this thought and this thought about what Thanksgiving is). Punk bass Godfather Mike Watt has an expression for low-budget touring – he calls it ‘jamming econo’ (the recent film on the history of his seminal band The Minutemen is called We Jam Econo). As a solo bassist, I don’t really have much choice but to jam econo – it’s not like I’m at the big budget tours end of the gigging spectrum, so it’s low cost all the way. But it would be a mistake to feel short changed and to aspire to the hotels ‘n’ limos end of things, as the econo-life brings with it a whole host of adventures that you just don’t find in hotels. I’m just back from a less-than-two-day jaunt to Madrid, to play a show and a masterclass with Spanish bassist Charlie Moreno – Charlie’s an excellent bassist and has become a good friend over the times we’ve met on shows, and he helped Lo. and I to find a couple of shows in Madrid back in March. He booked a show for the two of us at a cool venue in Madrid, on Tuesday. We had planned to do three or four shows, but the vagaries of concert booking took over and it became one show. So econo was clearly the only way to go. It meant that I couldn’t afford to get the train there, so I had to opt for a short-haul flight – something I’m generally loath to do, but was kinda stuck… So I flew into Madrid, got the metro to Dani’s house (Dani is the singer in Nonno), hung out, got lunch, and then Charlie arrived and we headed to the venue. 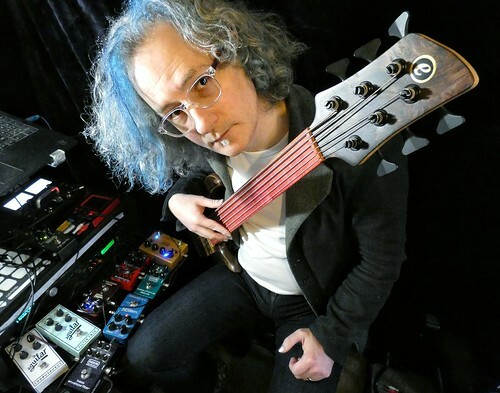 The masterclass shifted emphasis as a fair few of the people there weren’t bassists, so I got to talk a bit more about what looping allows a performer to do, and how it changes the relationship between performer and audience as compared to using a backing track or triggered samples. Charlie did an amazing job of translating some pretty deep concepts,all of which contained myriad layers of metaphor that relied heavily on the words themselves to make sense, requiring him to work out the meaning and translate the intention into Spanish – a tough gig, but one he handled like a pro! In the morning, I had breakfast and spent some time sorting out email things (my first time using a Linux Ubuntu instillation – wow! I need to get me an Ubuntu partition on one of my machines! ), I also got to watch a cool Niacin live DVD, and hang out with Carlos, a sound-engineering lecturer, and badass live and recording sound-monkey, much in demand in Madrid. We went for lunch, went shopping for jeans (my fave cheapie jeans shop in the world is in Madrid) and he then came out to the airport to help me carry my bass…. …the point of all the trivial nonsense detail is that most of that is stuff I’d have had to pay some anonymous person for if I’d been flying in, staying in a hotel, eating in restaurants, travellin in a tour bus, whatever… as it was, I got to hang out with some fascinating locals, eat cheaply in cool real spanish places (not the touristy stuff on the high streets), find out more about the local scene, and get to know bunch of lovely people. AND I came home having netted a sensible amount of money on a gig that grossed less than €400. So I had a better time AND spent less money. It really was, as the saying goes ‘all good’.